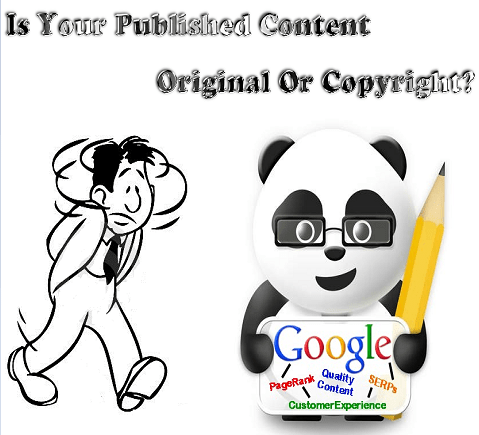 How To Check If Your Published Content Is Marked Copyright Or Original ? Hey! 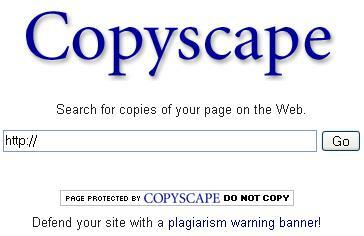 Folks today I will tell you how you can check if your content is copyright or not? The main purpose of this tutorial is to tell people who mix content from other sites and think they have fooled Google. Many bloggers do mistakes and they mix content of all websites into one article to fool Google which is wrong.So I advise you all to write unique and quality content because content is king.Now lets start the discussion how we can check if our content copies are on the internet.Few bloggers know about this only other newbies dont care and they spin articles on regular bases and think that they have fooled Google.But they dont know about Panda algorithm which is only built to catch content cheaters over the internet.Now let me come to the point how to check if content on your blog is copied from other sites or it is original.You can also check if content writers are fooling you by giving you copied content. How To Deal With Online Content Cheaters? How To Check If Your Content Is Duplicate? Now you can see in the up image my this written article is 100% unique so it has given me good results.If my any sentence would have copied it would have shown me the sentence.Now by using this tool you can check if your article is unique or not and the main and important thing is to protect yourself from Google Panda algorithm.If you have cheated someone’s content you will be caught by it and will loose all ranks.You can also catch some bad content writers who copy content from other websites any d then sell it to you.If their provided article does not have a good percentage kick them out and do not give them a single penny. 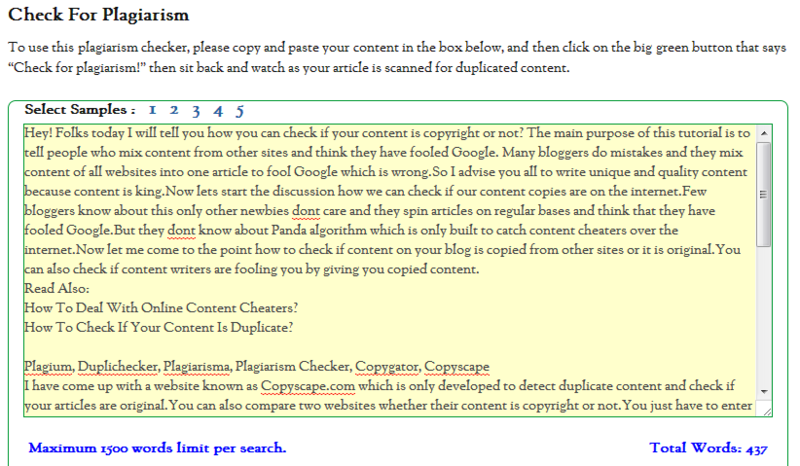 I have come up with a website known as Copyscape.com which is only developed to detect duplicate content and check if your articles are original.You can also compare two websites whether their content is copyright or not.You just have to enter the Url of your website to check if your content matches with another website or not.Just type your blog’s url and hit enter.It will come up with some results if your content matches with another site or not.Copyscape is a trial tool.You can use it only 5-10 times in a month after that you will have to buy it.But let me give you one tip.When your trial is finished change your proxy to enjoy it again.You can also defend your site with a plagiarism banner but I dont suggest you to put their banner because it is just for their website promotion.It is not beneficial.It will just increase your blog load time..! If you have some problems with copyscape then dont worry because these are some more tools to check copies of your page on the web.You can try these as well.They all have the same function. I tried my best to explain you all the procedure for checking duplicate content of your site and now is your turn.Please give us feedback of this tutorial and share this tutorial to support us we are eagerly waiting for your response.Thanks & Happy Blogging!